Rebuilding Together repaired more than 80 homes and seven community spaces severely damaged by flooding from Hurricane Sandy. Temperatures climbed into the mid-90s on July 16 as volunteers from home furnishings retailer Crate and Barrel helped rebuild three homes on Bruno Street in Moonachie. Rebuilding Together had already put new electrical, insulation, and sheetrock in two of the homes. Crate and Barrel employees from New Jersey, New York, Pennsylvania, and Connecticut arrived by 8 a.m. and spent the day painting and doing trim carpentry and installing flooring.Up the block, at a recently gutted home belonging to a family of four (who have been living in a relative’s basement since Sandy), volunteers put in subfloor and wall insulation (above). 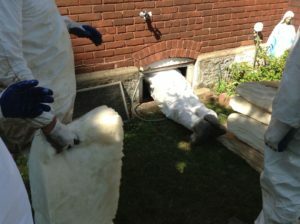 At two houses, several volunteers donned Tyvek suits, gloves, and goggles to go into each home’s crawl space and insulate underneath the home (left). Repairs were possible thanks to a generous grant from Crate and Barrel and additional support from the Hurricane Sandy New Jersey Relief Fund. 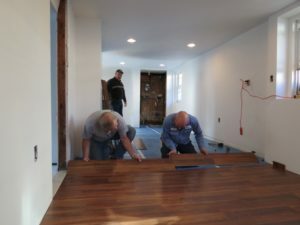 Last month, volunteers from Popular Mechanics and Delta Faucets put finishing touches on Jim M’s Joseph Street house so that he could move back home the first week in June, after having lived in a shelter, a rented apartment, and eventually with friends. A grant from Popular Mechanics allowed us to rebuild the home that had been gutted and mold remediated. New electrical was installed, as well as new walls and flooring, a new kitchen and appliances, new doors, landscaping, back porch and stairs, and the front walkway. Look for story and photos in the September issue of Popular Mechanics on sale now. 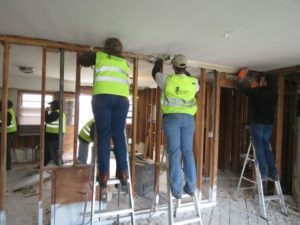 Volunteers descended on three homes in Moonachie in late March and early April doing rip-out and then installing subfloor, insulation, and sheet-rock. The homes’ first floor living areas, had been damaged when 3 to 4 feet of water entered their homes in a matter of minutes on October 29. Some have been living with relatives; one rents a small apartment that drastically cuts his limited-income budget. Our goal is to get them back in their homes as soon as possible. 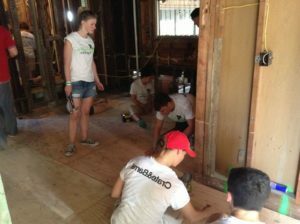 Several teams of AmeriCorps NCCC members and some “alternative spring break” students helped Rebuilding Together repair 125 Sandy-damaged mobile homes in Moonachie from January through May. 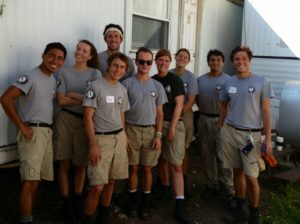 A new team, pictured here, has joined us for August and September and will be insulating 25 additional mobile homes. Funding for materials and supplies comes from the Bergen VOAD Long Term Recovery Group. Homes in the Vanguard and Metropolitan mobile home communities in Moonachie sustained water damage underneath and in some cases up to a foot inside the home. Insulation underneath had to be torn out, and new fiberglass insulation is put in. Water pipes get wrapped to prevent freezing. 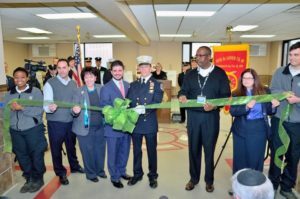 Ribbon cutting and reveal of the Little Ferry Hook & Ladder Co. No. 1 took place Wednesday, February 27. Present were County Executive Kathleen Donovan, Mayor Mauro Raguseo, Senator Paul Sarlo, the County Freeholders, Assemblywoman Marlene Caride, Assemblyman Gary Schaer, and Deputy Chief of Staff to Congressman Bill Pascrell, Assad Akhter, who presented a flag flown over Capitol Hill to each of the firehouses. Both the Hook & Ladder Company on Main Street and the Hose Company on Marshall in Little Ferry were flooded with three feet of water in minutes, even as the volunteer firefighters were helping rescue others in their community. Thanks to a grant from Sears and additional funding and assistance from Rotary District 7490, Rebuilding Together is able to repair both buildings. IBEW Local 164 electricians made repairs at the Hose Company and new walls have been framed, tiled, and painted. Homeowners Tom & Addie raised two children in their long-time family home, enjoying a street where neighbors still look out for one another. When Superstorm Sandy hit, the couple stood on the second floor of their house and watched water quickly rise to the sixth step. They lost two cars and everything on their first floor: their kitchen, living room, bathroom, laundry room, furnace and a new water heater. The family (Tom, Addie and a son who recently graduated from college) stayed with their married daughter while they used their savings to purchase a furnace and water heater, make repairs to the electrical wiring, tear out walls and re-sheetrock. Eventually they moved back home, living on the second floor, using a dorm-room refrigerator and a microwave for food preparation. 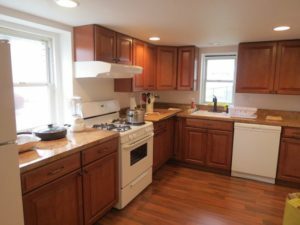 Rebuilding Together Bergen County, with a grant from Lowe’s, painted all the walls and installed new flooring, appliances, kitchen cabinets and countertops, and a new laundry room. Last time we visited, Addie’s homemade pasta sauce was simmering on the new stove, and Addie was grateful she can once again do laundry in her own washer and dryer, rather than go to the laundromat. View more local photos on our Facebook page. To read additional stories, click the “Press Room” link at the top of this page.